ASRock x370 Gaming X Memory Compatibility is fake? Quote Reply Topic: ASRock x370 Gaming X Memory Compatibility is fake? I have bought this specific motherboard because it had my memory on the compatibility list to 3200mhz. I am writing this because I am having problens setting xmp profile 1 (3200mhz) at bios. If I enter bios and set xmp profile 1, save and exit, sometimes it boots, other fails and enters bios in safe mode setting ram to 2400mhz. When it boots @ 3200mhz the system is not stable and I get some blue screens playing games. So far I have to use xmp profile 2 (2933mhz). Valter84, I do not think it is fake but you may need to tweak a few things. There are memory experts here that hopefully will help you soon - I'm no OCer. Please post the version of your BIOS, boot into BIOS and hit F9 (Load UEFI Defaults), F10 (Save and Exit) and try your XMP then. The experts will confirm this but I think many have run their memories faster than 3200 MHz but I do not know about this memory. I suggest you place your specifications in your signature so they will automatically appear on all your pages. Enjoy, John. You've missed some information in the Memory QVL. Note3: The O.C. mode is not guaranteed. It depends on whole system configuration and other parameters. Note4: When running XMP at DDR4 2667MHz or higher, the system?�s stability depends on the CPU?�s capabilities. You have been able to over clock your memory above the maximum specified speed for a Ryzen 7 processor, from 2667 to 2933. Memory rated at an over clocked speed of 3200 may be limited to 2933 in a Ryzen system to be stable, that is common. You might be able to achieve 3200, but will need some manual adjustments of the memory settings in the UEFI/BIOS. The XMP profile of your memory was designed for Intel X99 and 100 series chipset boards, as is the majority of DDR4 memory available. Also, as said above, the UEFI/BIOS version in your board can help you reach a higher memory over clock. AMD has provided mother board manufactures with several new CPU microcode updates that have improved the memory over clocking potential of some models of memory. Those microcode updates are included in various UEFI/BIOS updates. The latest version for your board is 3.20. What version are you using? One main adjustment in the UEFI/BIOS that is not done automatically by the XMP profile to help with memory over clocking is increasing the VDDCR_SOC voltage. That option is in the OC Tweaker screen. The default SOC voltage is 0.900V. Increase it to 1.100V to start, and if that does not work you may increase it safely up to 1.200V. Check that the DRAM voltage is set to 1.35V. Also, there are many other memory settings in the DRAM Timing Configuration screen besides the basic memory timings and speed. Try setting all of the memory options besides the four or five basic memory timings to a value of Auto. So, set the VDDCR_SOC voltage to 1.1V, set all the other memory options to Auto, and try the memory at 3200. This still may not be stable, all you can do is try. We also do not know what UEFI version you are using. I see that you are using the second XMP profile your memory has, for a speed of 3000, which was not supported in earlier UEFI versions with older AGESA microcode. Are you able to select a memory speed of 3000 with the UEFI version you are currently using? Be sure not to use this XMP profile and just change the speed to 3200, load the 3200 speed profile before doing the other changes. When the PC fails to POST with your current UEFI settings at 3200, the memory is set to its default speed of 2400, that is normal. For others reading this thread, this HyperX memory model has Hynix M-die memory chips. I am using the latest bios version for this motherboard. I already did clear cmos and load default parameters several times. Dram volatege is set to 1.35, despite on windows, if I check with software it says it is 1.25. Other people on the forum already talked about this. I hope it will be fixed on the next bios version. I will try adjusting VDDR_SOC and also the other parameters to AUTO to see if anything change and I can cold boot. Will update the thread later. I am not able to cold boot with memory set to 3200mhz, despite increasing VDDCR_SOC to 1.2v and dram voltage to 1.40. But setting manual speeds instead of XMP profile I was able to get 3066MHZ running with auto VDDCR_SOC, DRAM voltage @ 1.35 and timings 16-18-18-18-36. That Should be a boost. I bought this motherboard specific thinking I was able to get the 3200mhz... before I had Asus Prime X370 Pro... It looks I didn`need to change motherboard. what is your other subtimings ? To my findings its nothing more than a marketing gimmick, as memory manufacturers and motherboard manufacturers cant tell you for certain that the memory on their own qvl lists will work or not.. and the 3200mhz flare-x memory doesn't necessarily work on two different motherboards..
As I have a Msi b350 and had an msi x370 board, and currently runnign an asrock fatality professional gaming that 3000mhz (cl15) z170 specific memory worked fine on and ran faster than the 3200 flare-x memory and the 3000mhz z170 specific memory isnt even on their qvl list.. Now the 3200mhz flare-x memory also ran fine on both msi boards, but I had to increase soc voltage to 1.15 and dram voltage to 1.36 to get it to run on the x370 fatality professional gaming motherboard.... I'm still testing to see if its reliable or not, I had a boot issue with it a couple days ago, but I was trying to decrease the soc voltage when I got the boot issue.. I'm likely going to build a coffelake rig and abandon ryzen altogether, not all that impressed with it actually.. If motherboard manufacturers and memory manufacturers wouldnt lie to you, it would be a better market, but as it stands, me along with many others paid a premium price for memory that wont run at its default specified values and specific motherboard manufacturers are being extremely lazy with bios updates for their ryzen flagship boards..
What I find funny is Asrock wants to list the Flare-x on their qvl list, and Gskill swears it is qualified.. But you go on either forum and its a completely different story.. Which to me is completely false advertising.. 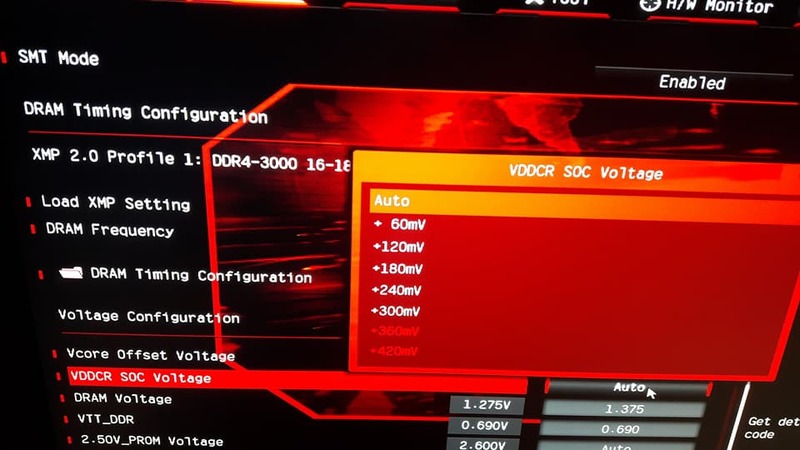 Qualified but it is not reliably qualified in the least bit, I think they just throw a kit in a board and mess with timings until they can get it to run somewhat and call it qualified..
@valter86 is your VDDCR SOC voltage in bios look like this? On the left side i have no numbers only in the right side which we choose auto, +60mv, +120mv and so on? Yes. On my tests to 3200mhz I have used +300mv and ram voltage 1.4v but didn`t boot. Regarding your question, I have set all the same parameters available @ xmp profile for the 3200mhz, but instead running @ 3066mhz. The system was not stable using those settings with 1.35 ram voltage. I had to increase it to 1.37 and now it`s stable and working nice with all benchmarks software (cinebench R15 CPU 1624 points) and with prime95 and occt. On OCCT stress test my cpu temperature goes until 65ºC then they go down to 62ºC and they stay like that running after 30 minutes. I believe it`s a good temperature for this CPU. Do you think new Agesa BIOS will bring support to 3200mhz?